Th!nkArt Salon and CIMMfest 2009 present Selections from the Book “An Eye on Music: 1982-2007”, by legendary French rock photographer Richard Bellia (bio), including images of leading rock and pop icons of the 20th and 21st centuries, including the Clash, the Cure, James Brown, Radiohead, Paul McCartney, the Rolling Stones, the Red Hot Chili Peppers, David Bowie, Nirvana, Metallica, and Bjork. The show debuts with an opening vernissage with the artist Friday, March 6th from 5:00 PM to 11:00 PM and continues through Monday, March 30, 2009. A complimentary screening of the U.S. premiere of the internationally acclaimed French film “But We Have the Music” (2008, 43 min. ), directed by Shanti Masud, will accompany the exhibition. 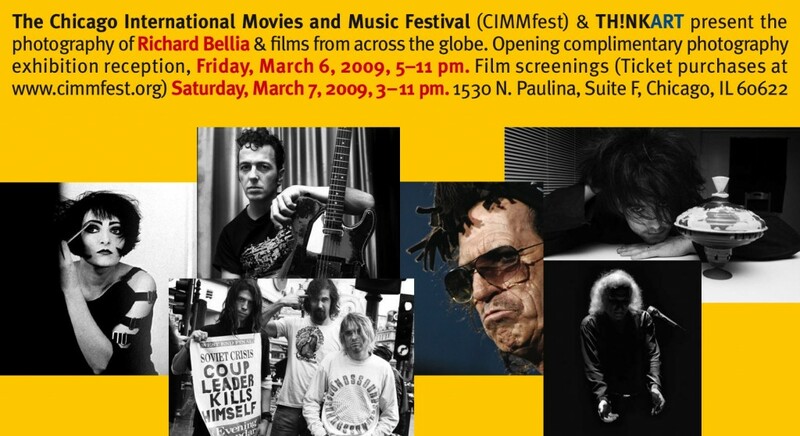 In addition, on Saturday, March 7th, Th!nkArt Salon will screen international films on music (ticket purchase required), including the Chicago premiere of “Becoming Pony Boi” (87 min, USA, 2008), the U.S. premieres of “Hardtimes Killin’ Floor Blues” (60 min, USA, 2008) and “Unifinished (Stations of the Cross)” (64 min, France, 2008), and a showcase of Encyclopedia Pictura music videos. Richard Bellia’s work comprises one of the most comprehensive catalogs of images of popular musicians ever assembled. The exhibition is part of CIMMfest 2009, a three-day, annual celebration of the intersection of moving images and music with screenings of award-winning international films, panel discussions, workshops, exhibitions, and musical performances at the Chicago Cultural Center in downtown Chicago, the St. Paul Cultural Center in Wicker Park, Th!nkArt Salon, and other venues.